Bullet Journaling is one of those planning crazes that I'm still gingerly dipping my toes into. So when The Coloring Notebook contacted me to check out their seriously clever coloring journals, I couldn't say no. Of course I snagged an extra one to give away to one of you. To me, the coloring notebook is a bullet journal on steroids. It gives you everything you'd want in a bullet journal and throws in seriously gorgeous coloring pages to boot. The cover is a thick, sturdy matte black. There's a handy strap to keep everything closed plus its A5 sized. It's priced fair compared to other bullet journals similar to it on the market, and it's just a lot of fun. Planning is all about finding a system that makes you feel more motivated. If you have a planner that you love to decorate, but never look at it again until the next week, it won't work for you. 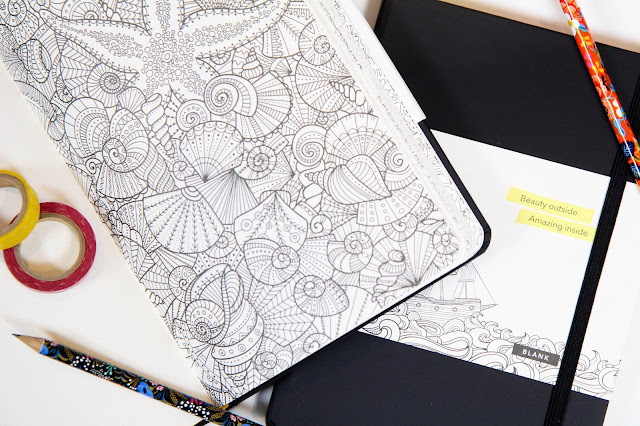 Adding coloring pages makes this notebook something you reach for when you're winding down. So you'll inadvertently find yourself looking at that to do list for tomorrow while coloring in a fun page. You won't know it, but it'll make you more productive in the long run if you spend more time with your planning devices. If this notebook sounds right up your alley, enter the giveaway! It's open internationally for anyone 18-years-old or with parental consent!